Lawsuit filed by Chattanooga City Councilman Chris Anderson. 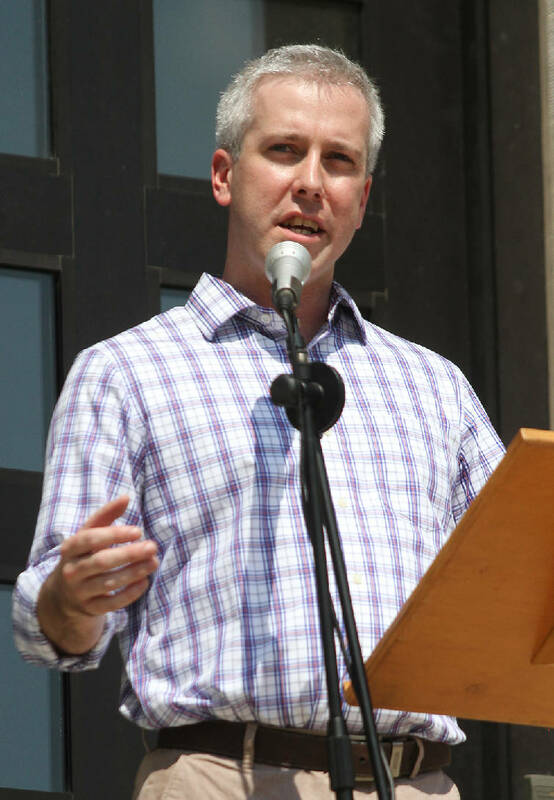 As a group of District 7 residents collects signatures in a bid to recall Chris Anderson, the openly gay Chattanooga city councilman fought back Tuesday by filing a lawsuit to throw out the petition, claiming it is discriminatory and unconstitutional. Opponents say they want to unseat Anderson because he has failed to represent them, but the councilman's suit points to repeated criticism of his bill to extend benefits to the gay and straight domestic partners of city employees. Anderson argues that opponents really want to remove him because he is gay. "It's become patently obvious what's going on here," said Anderson's attorney, Stuart James. "It's discriminatory. It's our position that under the constitution you can't call a recall election" on that basis. The lawsuit filed in Hamilton County Circuit Court asks a local judge to temporarily stop the petition until the courts can rule on whether it is valid. The Hamilton County Election Commission, which certified the petition last week, and citizen Charlie Wysong are named in the suit. Wysong, who is not a District 7 resident, is helping with the Anderson recall and helped spearhead efforts to put his domestic partner benefits ordinance to a citywide referendum on the August ballot. Wysong has said Anderson's opponents want the recall on that same ballot. But if a judge grants a temporary injunction because of Anderson's lawsuit, that could push the referendum back to November or even 2015. As the latest example of what Anderson claims is discrimination, his lawsuit cites a Monday meeting attended by several St. Elmo-area pastors. During the course of the meeting, Anderson's domestic partner ordinance is called a bad example to their children and an "abomination to God." However, one of the pastors said Anderson's lifestyle choice was not for them to speak out against, the suit states. Youth Minister Jonathan Johnson of Church of the First Born in St. Elmo, who addressed the public at the meeting, couldn't be reached for comment. Wysong agrees that some people are opposed to Anderson because of his domestic partner ordinance. But he argued that doesn't mean the residents are discriminating against the councilman because he is gay. "He's deeply offended the beliefs of this city," Wysong said. "We have a right to hold different views than other people." Anderson's district includes Alton Park, East Lake and parts of downtown and St. Elmo. Several Alton Park leaders say they want Anderson recalled because he hasn't worked to better the community and has openly insulted neighborhood leaders. They say they knew Anderson was gay when they elected him. Election Commission Chairman Mike Walden said the commission doesn't have a position on the recall. The only thing commission members can do is follow state and local law to decide if the petition is legal, he said. "We don't have the option, nor is it our duty to find out what someone's motivation is," Walden said. "We're not a court that can decide those things." Along with the request to find the recall petition unconstitutional, Anderson's lawsuit also asks the court to find that the city's recall statue is vague and against public policy. The suit argues that someone could recall a public official for any reason. Election board members acknowledged in their meeting last week that Chattanooga's ordinance gives voters the leeway to recall a city official on almost any grounds and should be more specific. "It's one of the most vague, overbroad statues," said board member Jerry Summers at the Feb. 13 meeting. "If Mr. Anderson likes vanilla ice cream and Mr. Wysong [helping with the recall effort] likes strawberry, that might be enough." Residents have until April 29 to collect 1,600 signatures -- 15 percent of the registered voters in District 7 -- to put the recall to a public vote. Contact staff writer Joy Lukachick at jlukachick@timesfreepress.com or 423-757-6659.